I document my participation in the 2011 International Polar Year Field School (IPY-FS) in Svalbard, an archipelago north of Norway. I provide a glimpse into life on the northern island, including photos, videos, and descriptions of my experiences as I learn the ecology, oceanography, glaciology, and atmospheric physics of the arctic. I show how IPY-FS teaches students about polar sciences and provide a summary of what I have learned. I look forward to sharing this exciting experience! So, for those of you who have been following my progress (or lack there of) here in Svalbard - part of the program includes making a blog. Since it was a bit redundant to write one myself along with the one we are making as a group I have been neglecting this blog. The program blog is not yet online but should be in the next two days (on the IPY-FS site). For now, I encourage you to check out the pictures on Facbook or blogs from previous years (also on the IPY-FS site). Where is Svalbard? What am I doing? I am a graduate student in MIT's program for Computation for Design and Optimization (CDO). I do research with members of MIT's Program on Atmospheres, Oceans, and Climate (PAOC) on the sensitivity of ice sheets/shelves to changes in forcing parameters, such as basal friction, surface topography, or temperature. This blog is to document my trip to Svalbard, Norway where I will participate in the 2011 International Polar Year Field School (IPY-FS) from June 18, 2011 to July 10, 2011. IPY-FS is an interdisciplinary program for 25 students from 11 different countries. The students all have an interest in polar sciences and the course is designed to teach us about current research being done in arctic regions. There will be a wide array of subjects from polar ecology to glaciology and meteorology. Svalbard is an archipelago north of Norway. I will spend most of my time in Longyearbyen (about 78 degrees north), which is the largest settlement in Svalbard. 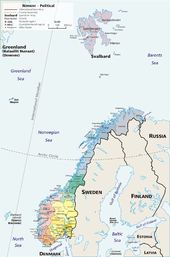 The image on the left (from wikipedia) shows where Svalbard is in relation to mainland Norway. The program begins in about one week, I am currently making last minute preparations. I leave from Boston on Saturday, June 18 and arrive in Longyearbyen on Sunday, June 19. I am excited to see where I will be spending the next three weeks and to meet my classmates. This will be a fascinating experience and an opportunity to learn about the wide array of problems being addressed by Arctic researchers. I will do my best to provide daily updates about my life in Svalbard. I am looking forward to this experience and I am excited to share it.